Math Exponents Games Middle School Students love to Play!! Let's bring some some fun and excitement to learning exponents. Not sure how exponents work? 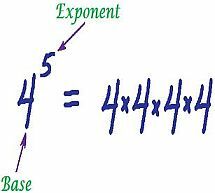 Check out this short explanation on exponents. Exponent Battle: Here's a fun card game that helps kids practice using exponents. All you need is a deck of playing cards and you're ready to play! Basketball Math Exponents: Get practice working with exponents with this online activity. Slam dunk with the right answer. Be sure to hit the back button after answering each question for a new problem. Asteroid Exponents: Try to shoot the asteroids while practicing exponents. This game also uses the order of operations too. Once you click to the page, just click on level 1, level 2, or level 3 to begin. Exponent Video Tutorial: For even more help on exponents, this short video tutorial does a good job of making exponents easy to understand. These games will help reinforce the new rules about exponents and pretty soon your child will know exponents like the back of her hand. The math exponents games are so fun, they will even want to continue playing after the games have helped them master the concepts. If you have any ideas or suggestions for other games involving exponents, be sure to contact us. We'd love to hear from you. Or if you want to share a game you know about that will help students learning exponent, we'd also love to hear bout it so we can share it with our visitors.